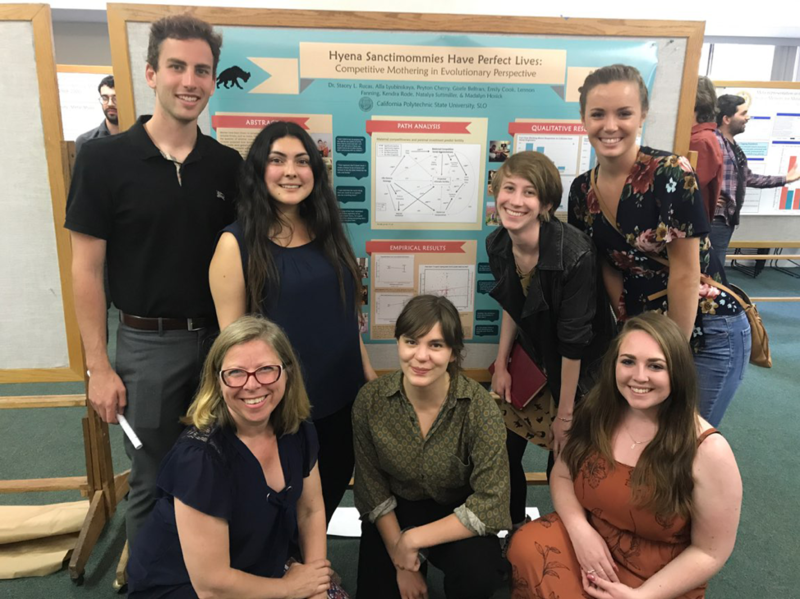 During the winter and spring quarters of 2018, a talented group of anthropology majors embarked on an ambitious research project led by Dr. Stacey Rucas. The students examined maternal competition within the broader context of social media from an evolutionary perspective. After developing a complex set of specific predictions, they gathered data from online sources about the interpersonal behaviors of mothers with one another. This mixed-methods project also involved conducting qualitative and quantitative data analysis, including path analysis. This exceptional group of students happily spent many an otherwise free Friday and Saturday in the Kennedy Library Labs seeing their project to completion. In May, the team presented the findings at the annual California Workshop on Evolutionary Social Sciences held at UCSB. Their work was well-received by the professional group of mostly academics and graduate students. We are proud to have this fourth undergraduate team of Cal Poly anthropology majors present such high quality work at this significant academic event.